Do you have a huge list of friends in your profile? You noticed that your friends reduced but you have no idea on who actually deleted you from their friends list. Well, don’t you worry! There’s a small user script known as Unfriend Finder that identifies which of your friends are not faithful to you and took you off from their friends list. A small Unfriend link on the right hand top corner uncovers the truth! 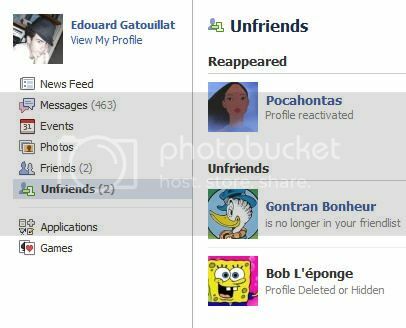 Apart from this feature, Unfriend Finder also helps to spot out who have not yet accepted your friend request. To make it even more interesting you’ll also be aware of who decline your friend request. Hey buddy! if you are adding unknown girls, you can keep a good track of who’s accepting you!